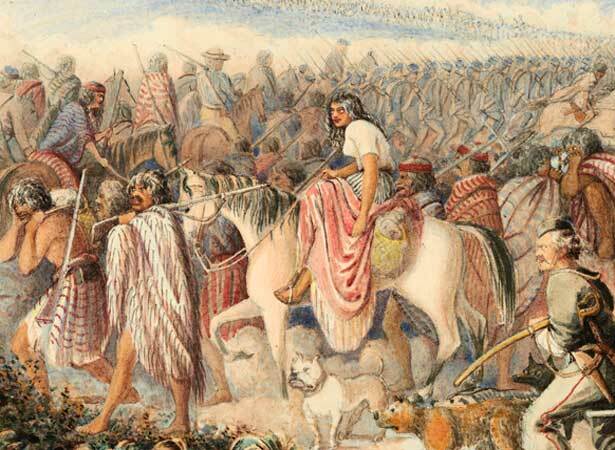 Over a thousand troops commanded by Duncan Cameron set out on what was to be the general’s final campaign in New Zealand. Governor George Grey and the colonial government had been unable to persuade Cameron to mount a further campaign in Waikato. Keen to make use of imperial troops while they still had them, they turned their attention to south Taranaki, a ‘secondary bastion’ of Māori independence. Grey was unimpressed with what he saw as a slow and timid advance. Pai Mārire leader Te Ua Haumēne had allegedly mocked Cameron by dubbing him ‘The Lame Seagull’. But in reality Cameron’s operations were largely effective. He won substantial victories at Nukumaru on 24–25 January and at Te Ngaio on 13 March. It was his refusal to attack a modern pā at Weraroa that led to the collapse of his relationship with Grey. Cameron had learnt from bitter experience in Waikato ‘that it is not generally desirable to attack such positions’. Grey enhanced his reputation at Cameron’s expense when he ‘took’ Weraroa in July. The pā had long since lost any strategic significance and only a small number of Māori defenders remained in it. Cameron had submitted his resignation early in the campaign, and it was now accepted. The general left New Zealand on 1 August. We have 7 biographies, 5 articles, related to British troops invade south Taranaki .